Day 1 of Surgery Clerkship Rotation: This Daily Doodle highlights the anatomy seen during a laparascopic cholecystectomy and contains a few other knowledge goodies, including Calot’s Triangle and Charcot Triad. 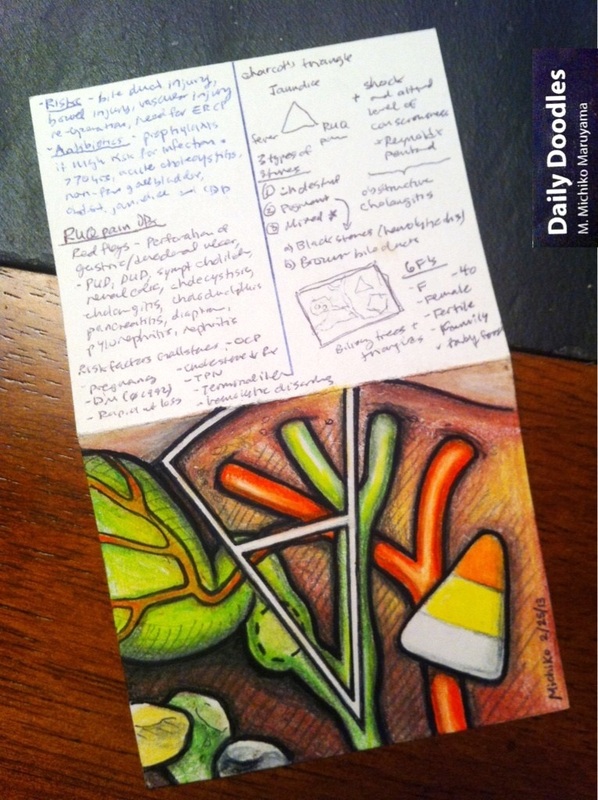 I have read a few different variations of Calot’s Triangle, but the most frequent description is, an anatomical space marked by the common hepatic duct as the medial border, the cystic duct as the lateral border and the cystic artery as the superior border, as seen as the smaller triangle in the Daily Doodle (1). The Hepatocystic Triangle is the larger triangle, where the superior border is the liver’s edge and the cystic artery becomes framed by the triangle. Also enclosed in the Hepatocystic Triangle is the cystic lymph gland of Lund (1). In a few othersources, Calot’s Triangle is synonymous with the hepatocystic triangle. This Daily Doodle also shows acute cholecystitis (inflammation of gallbladder) caused by an impacted stone in the cystic duct (dotted circular lines). There are 3 types of gallstones: 1. Cholesterol (large and smooth), 2. Pure pigment (bilirubin) stones which are smooth and green or black and 3. Calcium bilirubinate stones that are associated with infection or inflammation of the biliary tree. Risk factors for gallstones include oral contraceptive pills, pregnancy, rapid weight loss, TPN, terminal ileum dysfunction and hemoytic diseases. The common clinical presentation of acute cholecystitis includes right upper quadrant pain, fever, nausea and vomiting. Patient may also have a palpable gallbladder and a positive Murphy’s sign (interruption of inhalation while examiner palpates gallbladder). In addition, the patient often has a history of chronic cholecystitis. Diagnostic tests for acute cholecystitis include gallbladder ultrasound and, if further testing is required, a HIDA scan. Ultrasound findings include gallstones and thickening of the gallbladder walls (3). Treatment of acute cholecystitis includes cholecystectomy (laparosopic or open) and perioperative antibiotics. Timing of surgery includes immediate surgery within 72 hrs of the onset of symptoms or delayed surgery, approximately 6 weeks after resolution of the acute inflammation (3). Other indications for cholecystectomy (laparoscopic or open), include: asymptomatic cholelithiasis in patients who are at increased risk for gallbladder carcinoma or gallstone complications (note: if suspicious of gallbladder carcinoma, perform open cholecystectomy rather than laproscopic), acalculous cholecystitis, gallbladder poplyps >0.5 cm and porcelain gallbladder. Contraindications include anesthetic concerns, diffuse peritonitis with hemodynamic compromise and uncontrolled bleeding disorder (2). The random candy corn represents Charcot’s Triad, a constellation of clinical symptoms characteristic of acute cholangitis (infection of the bile ducts): right upper quadrant pain, jaundice, and fever. C. Palanivelu. “Art of Laparoscopic Surgery Textbook and Atlas (2 Vols. )” Jaypee Brothers Publishers, 2005. P. Malladi and N. Soper. “Laparascopic Cholecystectomy“. Uptodate.com. December 30, 2013.